of blindness worldwide. Scars are defined by the persistence of myofibroblasts in a healing wound, which secrete disorganized extracellular matrix and promote activation of the fibrotic growth factor, TGFb. We have identified an innovative approach that directly and specifically targets the myofibroblast population that develops after wounding promoting regenerative healing in the eye. 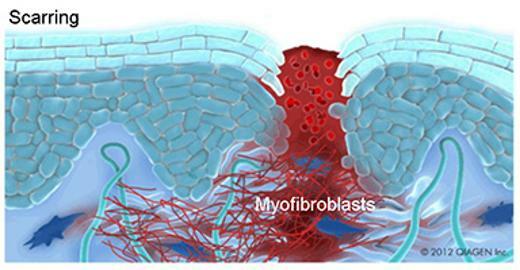 Working model to prevent myofibroblast persistence. Acute and chronic injury to tissues induces cellular stress pathways. Tissue wounding and fibrotic growth factor activity induces an increase in the deubiquitinase (DUB), USP10. We found that USP10 removes ubiquitin from internalized avb1/b5 integrins saving them from degradation and promoting integrin recycling. 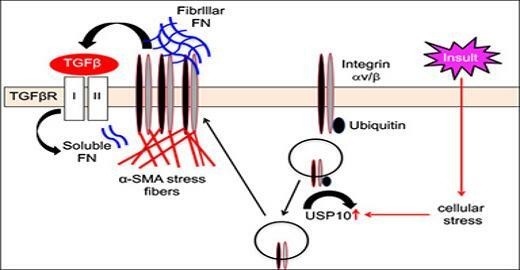 We propose that the increase in USP10 DUB activity shifts the balance of integrin degradation/recycling to yield a net accumulation of integrin on the cell surface and that this in turn leads to pathological cell adhesion, activation of TGFb signaling, and myofibroblast differentiation. Current work includes studying the role of USP10 and other DUBs in wound healing as well as in vivo targeting of DUBs to promote regenerative healing. Our work on Exfoliation Glaucoma (XFG) also has broad consequences for the prevention of blindness. XFG is the leading identifiable cause of glaucoma affecting millions of people worldwide. We have discovered that a significant lysosomal/autophagy defect defines primary cells isolated from the eyes of exfoliation patients. Our studies suggest that an age-related autophagy defect may be an underlying cause of this blinding disease. Mechanistic cell biology studies in combination with drug screening to correct the autophagic dysfunction are currently underway. Patient-derived Exfoliation Glaucoma Tenon Fibroblasts Display Dysfunctional Lysosomal Positioning. Under serum starvation conditions the cell induces autophagy pathways to generate energy (catabolism). During this process lysosomes and autophagosomes relocate to the peri-nuclear area where they fuse, initiating the degradation of cellular waste. In Exfoliation-tenon fibroblasts lysosomal relocation to the peri-nuclear area is dysfunctional suggesting that their degradative function is impaired. XFG (A), POAG (B). 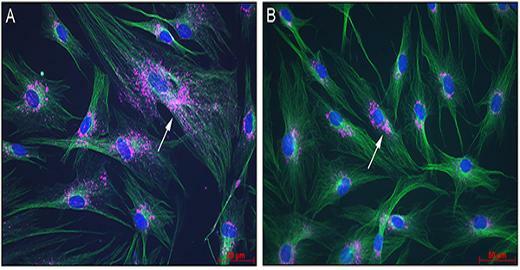 Tenon fibroblasts were seeded on collagen-coated coverslips in supplemented serum-free media. After 24h cells were fixed and immunostained for lysosomes (LAMP1, pink, arrows), microtubules (b-tubulin, green), nucleus (DAPI, blue). N=4 for each patient type. Bar =50um.